by Elena Peters | Life, Midlife Reinvention, This post may contain affiliate links. Please see Disclosure Policy. I love the way a new journal feels in my hands. I love the way a new pen, flows over crisp, white pages. I love the promise of organization and goal setting. Every year, if I am not gifted a beautiful, custom and expensive journal at Christmas, I run out to an exclusive stationery store and buy one. It sets me back quite a few bucks, I tell ya. Once I get it home, I eagerly fill in the first few weeks. Then I try to adapt the other sections for my needs. I take it everywhere with me…in the beginning. But inevitably, by the end of January, my new journal is on a shelf somewhere collecting dust. It’s really disappointing, isn’t it? You feel like you failed the journal, sitting all lonely and unused under some magazine in your office. But in reality, that journal has failed you. A journal should be a tool to help you stay organized in your tasks and your thoughts. It should adapt to your needs and make your life better, simpler. If it can’t do that, it deserves to be forgotten. And that is why I am absolutely in love with this new craze called bullet journaling, developed by Ryder Carroll. 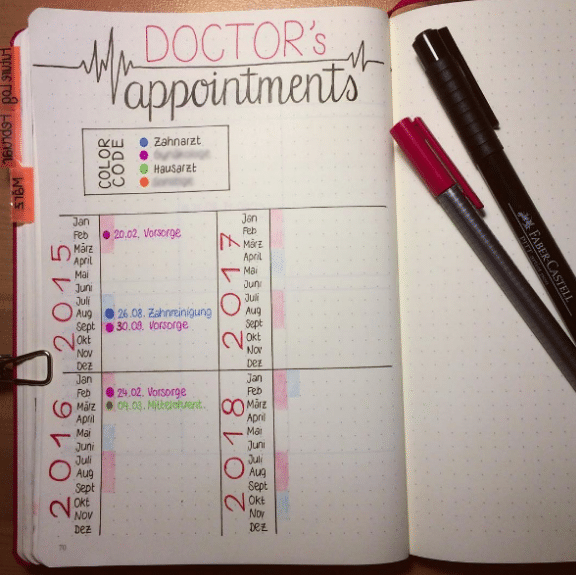 This simple organizational system is for those that never seem to be able to find a journal that fits their needs. It can be simple, see the video by Carroll, or it can help release all of your pent up creative juices, as you will see demonstrated in some of the bullet journal layouts below. 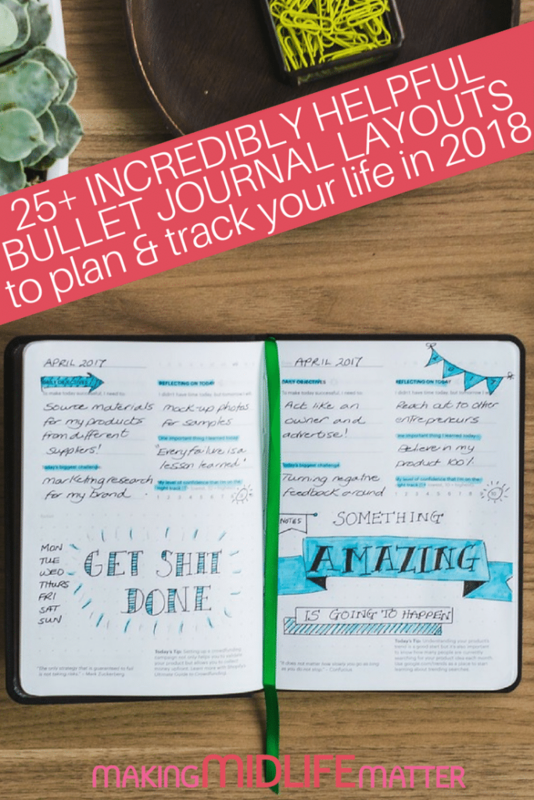 A bullet journal will help you set, plan and achieve your goals as well as get you super organized for 2018, if you use it. I am going to warn you right now if you are new to the bullet journal phenomenon, there is a learning curve. And it will get messy in the beginning. It won’t be perfect, trust me. And I suggest you start out real simple, like the developer intended. Don’t get all frou frou and fancy till you have the organization part down. Because just like a regular journal, it’s useless if it is not functional for you and your life. Honestly, you can use any blank notebook and pen to get started. I highly suggest that you just visit your nearest dollar store for supplies. Don’t go out and spend money before you decide if this system is for you. Here comes the fun part! 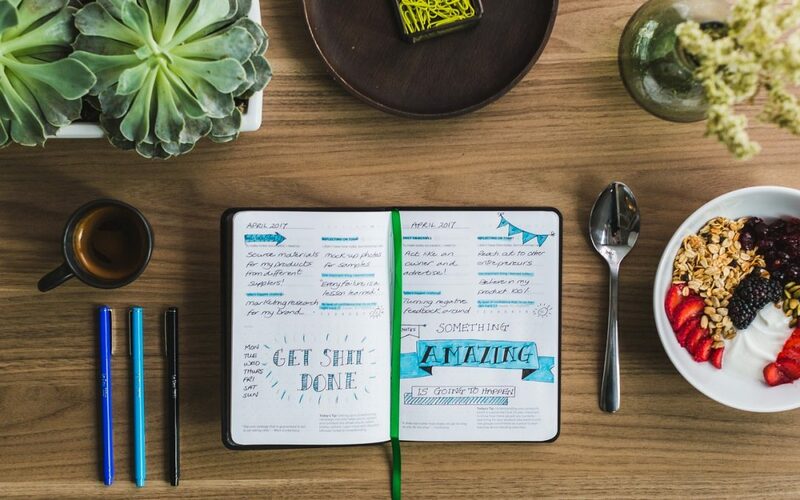 Look through all of these bullet journal layouts and decide which ones are for you. Don’t forget to check out Instagram and Pinterest for more. New Bullet Journal – Birthdays and Anniversaries I'm still working to set up my third Bullet Journal in my beloved @scribblesthatmatter A5 with Dotted Pages. I'm so hoping for some journaling time this weekend! This spread finally got finished. I modified it to just six months, because that's how long I've been in each journal. Notice ChoreRs. Haha. Oops. I also got confused the first week or so. I added "no spend" where "dishes" has been all along. I had to mark through. Sadly I didn't get as many No Spend days as I wanted. You can definitely see what chores are regulars and which aren't. Write a book, one chapter at a time. I decided a couple weeks ago that 100% of what I made on eBay was going to go towards our debt. I'm nowhere near making what lots of others have been making on eBay but I feel like every little bit counts. This is page one of my debt tracker. Every square is equal to $100. There are two other pages and we have a total of about $19,000 of debt (not including our house). I'm starting with our smallest and working up to the bigger debts later. That way once I have one paid off I can roll the monthly payments over onto the next one. Here goes nothing! My goal is to have it all paid off in one year. I'm not sure how realistic that is at this point but I'm aiming high! Wish me luck! I got this cute hexagon idea from @heysheplans ❤️ I'm such a visual person and this helps the process to be more fun for me. STEP COUNT. I started tracking the amount of steps I take during the day when I noticed I actually do quite a bit of walking at work. I don’t have a goal per say to walk 10 000 steps per day but it’s interesting to see how often it happens without me even thinking about it.